What are the Goals of the Dantzer Lab? What’s it like in the Dantzer Lab? Our lab aims to be a highly dynamic, diverse, motivated, and collaborative group that operates under the fundamental theorem that enjoying what you are doing drives personal and group success. We consider ourselves integrative organismal biologists and are fascinated by questions about the ecology, evolution, and physiology of animal behavior and life histories. We are a democratic group and each group member is expected to play an important and equal role in the lab. We focus on inter-disciplinary research and expanding the scope of our research about animal behavior, physiology, and life histories. For example, in the past we have had weekly lab meetings along with Nyeema Harris and her lab group in Ecology and Evolutionary Biology at UM. Currently, we meet each week with members of the Simien Mountains Gelada Research Project. Diversity is central to the mission of the Dantzer Lab and we aim to be a welcoming and inclusive lab group. We value different perspectives and are passionate about increasing diversity and equity in academia. We aim to provide safe working environment where all students feel 100% supported and we strongly encourage students from underserved or non-traditional backgrounds to join the lab. Want to know more? Please read the Dantzer Lab Manual that contains a clear list of what you can expect and what we expect of graduate students and post-docs. Note there is an additional lab manual that covers specifics and further particulars of being in the Dantzer Lab if you join the lab! I am always looking for post-docs to apply to work within the lab. Sometimes I have my own funding available and I usually advertise these positions on EvolDir or ECOLOG. I am also very happy to help develop and write post-doctoral fellowship applications for NSF and NIH. There are also intramural postdoctoral fellowships available through the Michigan Society of Fellows or through the LSA Collegiate Fellows program administered through the College of Literature, Science, and the Arts. I would be happy to work with you on these applications whether you are interested in research, public engagement, or teaching. Please contact me if interested. The first thing you should do is read the Dantzer Lab Manual to assess your fit with the lab. Prospective Ph.D. students should think seriously about graduate school (see a great set of resources here). It is an extremely challenging and time consuming endeavor but it is extremely rewarding. I am always looking for highly motivated and energetic students that are interested in basic questions that integrate animal behavior, physiology, evolution, and ecology. I am happy to have Ph.D. students pursue their own research questions while providing lots of guidance. I expect that Ph.D. students will carry out field work and combine this with laboratory analyses. I will also consider students that have excellent laboratory skills but do not have much field experience. I am looking for new Ph.D. students to start in Fall 2019 (applications due December 1 2018). I can accept new Ph.D. students at the University of Michigan through the Department of Psychology in the Biopsychology Area. This is a highly productive research group with unparalleled laboratory resources both within the Department and on the University of Michigan campus. There are also numerous faculty on the campus of University of Michigan in various departments and programs that you can interact with as a graduate student in my research group (e.g., faculty and their students in Ecology and Evolutionary Biology, Molecular, Cellular, and Developmental Biology, Anthropology, and the School for Environment and Sustainability). The University of Michigan is consistently ranked as one of the top research universities in the world and best public school in the USA (see here), and has excellent resources and funding for graduate students for their research or travel to conferences (see here). The University of Michigan graduate program in Psychology and Behavioral Neuroscience are ranked as the best in the entire USA (see rankings here). The University of Michigan and our Department is top notch! Ann Arbor is also a wonderful city and is consistently ranked as one of the top places to live! I can also co-supervise MSc. and Ph.D. students in the Department of Ecology and Evolutionary Biology. Please contact me if interested. Applications for entry into the Ph.D. program at UM are due in early December of each year. Please contact me well in advance of December if you are interested in applying to join the lab. When you write an email to me expressing interest in my lab, please describe your 1) research interests, 2) past experiences and skills, 3) reasons for why you want to join my lab, and 4) GPA. Prospective students may also be interested in attending the Diversity Recruitment Weekend held each October in the Department of Psychology. We love having undergraduates involved in our work and this is illustrated by all the fantastic alumni! There are often spaces available for undergraduate students to assist with our research projects or carry out their own independent project during the academic year and during the summer months. These positions may involve laboratory work, literature analyses, or other tasks. I expect undergraduates to be highly motivated and interested in the science while at the same time treating them like a peer. Interested undergraduate students should email me directly and also see my project advert on the University of Michigan Undergraduate Research Opportunity Program. Undergraduates interested in field research in the summer should contact me in January-February. There are opportunities to work on on the Kluane Red Squirrel Project from May-August in each year. There are also opportunities to perform field research at the University of Michigan Biological Station (UMBS) to study questions regarding how small mammals respond to climate change through the UMBS NSF REU Program. Each year we hire 4-8 field technicians to work on the Kluane Red Squirrel Project. Successful applicants learn loads of new field and laboratory skills and get to live in the beautiful Kluane region of the Yukon. It is a rustic field site known as “Squirrel Camp”. These are 2-6 month long positions and are highly competitive. We usually advertise these positions in November/December of each year under the News page. 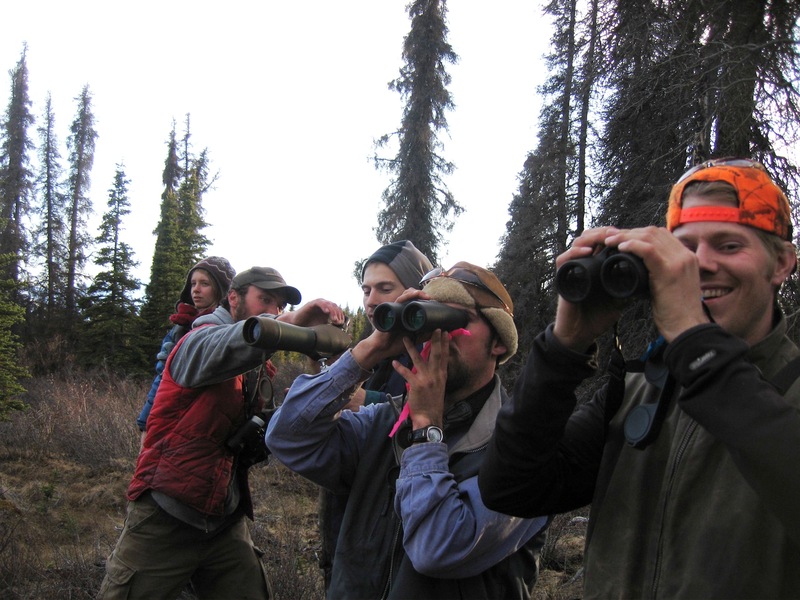 Positions are also available through the other universities that help run the Kluane Red Squirrel Project. The Kalahari Meerkat Project hires ~15 field technicians each year. For more information on these volunteer positions, see their website.